Last week the kids and I had the opportunity to visit one of the most beautiful places that I have ever seen, sorry to say to some of my favorite places this may move to the top of my list! 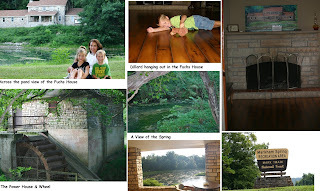 A while back, I came across a tiny write up on Markham Springs located in Williamsville, MO and I knew from the moment I saw the picture I had to visit this place it is just that beautiful! I won't lie it took me some time to track down all the information I needed about this place, but I will make it easy on you guys and give it to you, after a bit of research the photo I had seen was a picture of Fuchs House located in the Markham Springs Recreational Area.